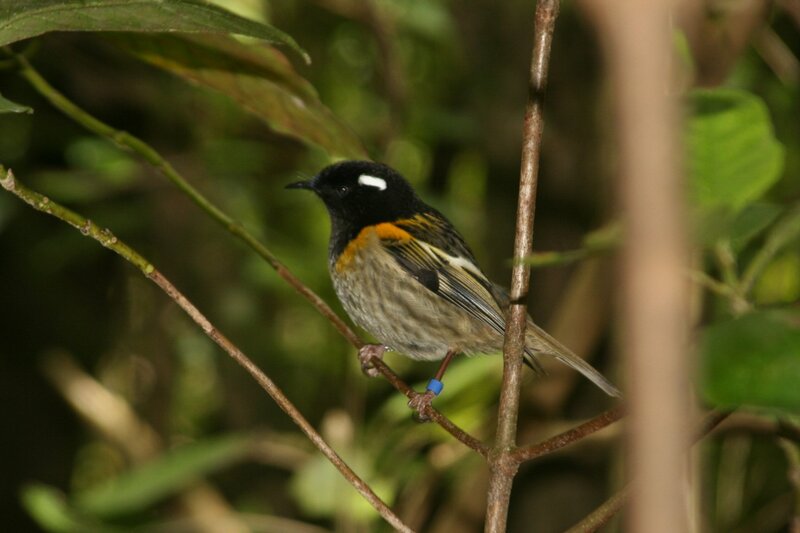 When I first visited New Zealand, back in 2000, the Stichbird was just a rare species of honeyeater (Meliphagidae), one of three representatives of that Australian family to be found here. It was the smallest species and the rarest, and I only saw them on one small island (even today they are only found on a handfull of islands, see below). It certainly resembles one, and has plumage that brings to mind the New Holland Honeyeater, a common bird if you’ve ever been to Sydney. It has a brushy tongue and a diet heavy in nectar, and nearby Australia is full of honeyeaters of all shapes and sizes, as are many of the islands around Australia. But it turned out that Stichbirds were not honeyeaters. 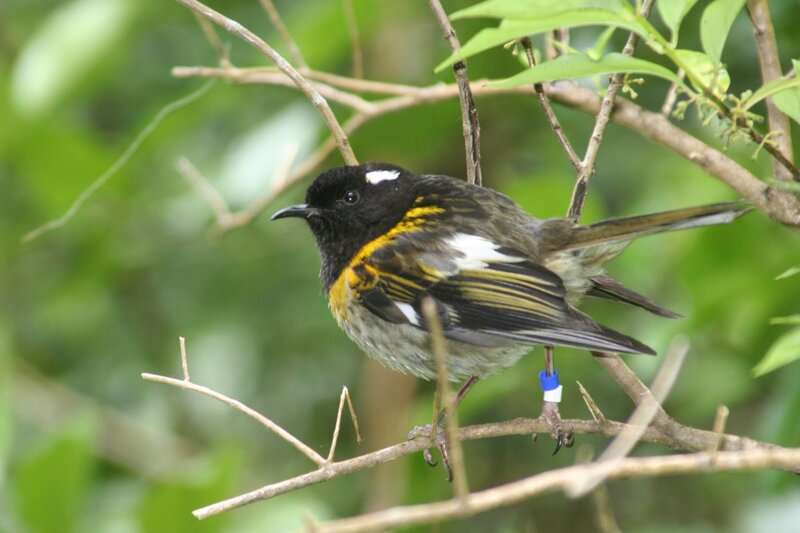 A series of DNA studies published in 1980 found that the Stichbird wasn’t remotely close to the honeyeaters. Their closest relatives were another family of New Zealand birds, the New Zealand wattlebirds (Callaeidae), which is made up of the Saddleback, Kokako and late and missed Huia. They are also closely related to two obscure New Guinean families, the berrypeckers and the satinbirds, at the base of the Corvoidea, a superfamily that includes many Australian families as well as the better known crows and shrikes. At any rate it was distinctive enough to merit its own family, the Notiomystidae. 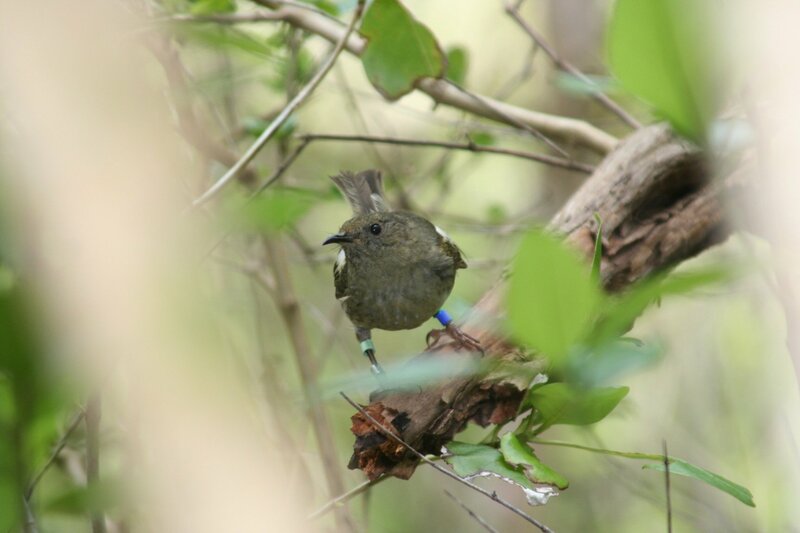 The Stitchbird certainly is as distinct as it is similar to the honeyeaters. Unlike them it nests it cavities. It is unique amongst all birds in that it mates face to face, actually something of an oddity amongst animals in general actually. Like many birds the plumage is sexually dimorphic, with the females being drab olive with some white and yellow on the wings and the males having impressive black, yellow and white plumage. 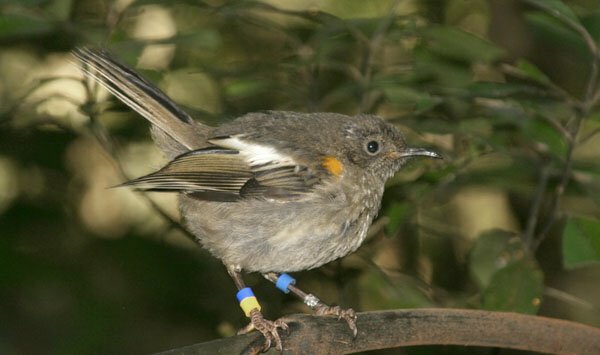 The Stichbird is also an example of the remarkable vulnerability of New Zealand’s avifaunua (a sentence I type remarkably often on this blog). It declined rapidly across New Zealand due to a combination of habitat loss, overhunting and introduced predators, and by 1883 it was found only on Litte Barrier Island. 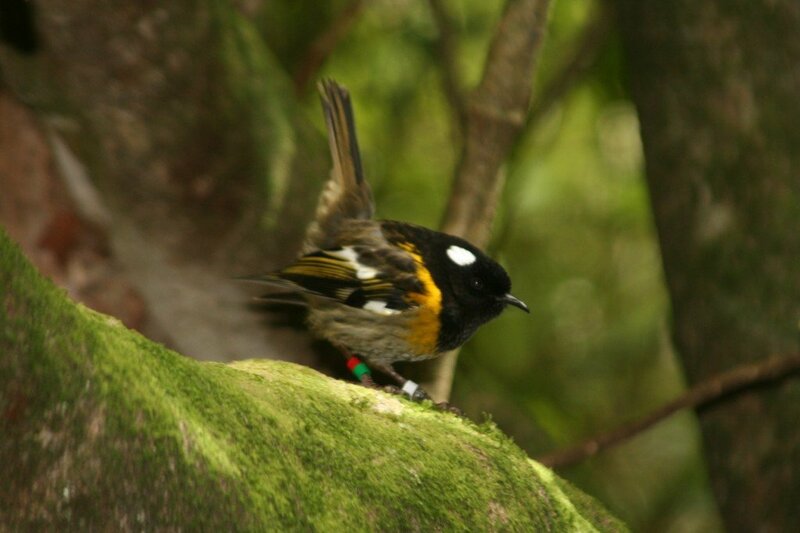 It has been translocated to a number of other islands in recent years, but these new populations have required intensive management, with supplementary feeding and nesting boxes. The species is stable at present, but with only one secure population there is some work to do before it is out of the woods. 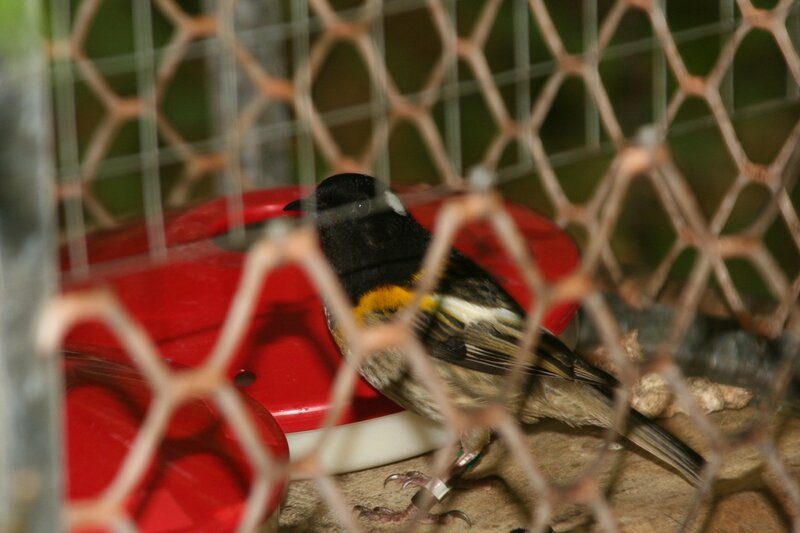 Supplementary feeding is important for the translocated Stitchbirds. The mesh keeps the more aggressive Tui out. A lovely bird and post. How sad that it’s so endangered! Are the Stichbirds in these photos banded because of the management program? So interesting that DNA studies were needed to properly place them taxonomically. Where Are You Birding This Fourth Weekend of August 2008?